1/2 cup corn flake crumbsPre-heat oven to 350. Place chicken breasts between sheets of wax paper. Use a rolling pin, flatten to around 1/4 inch thick.In a bowl, beat cream cheese, parsley, onion, garlic salt and pepper and lemon juice until blended. Spoon 2 tablespoons of the cream cheese mixture on each piece of chicken. Roll chicken. Coat rolls with flour, dip in egg mixture, then roll in corn flakes. Drizzle some olive oil in a large skillet. Cook over medium heat. Make sure to brown on all sides. Place chicken rolls in a baking dish. 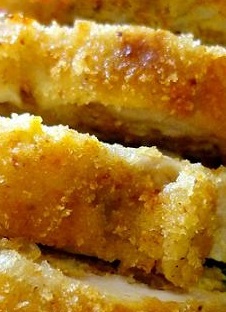 Bake for 30 minutes or until chicken is fork tender and juices run clear.